My friend Adam introduced me to Zaitzeff way back before I started this blog. 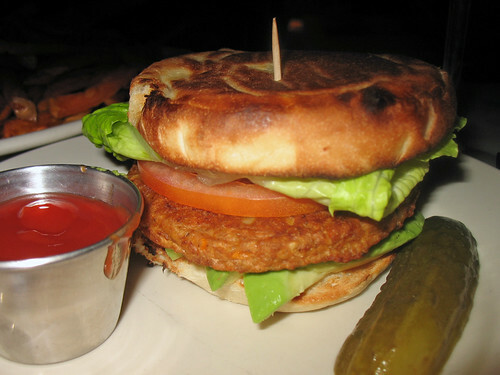 I had eaten their veggie burger, and remembered it as being pretty good, so I finally returned to do a proper review. 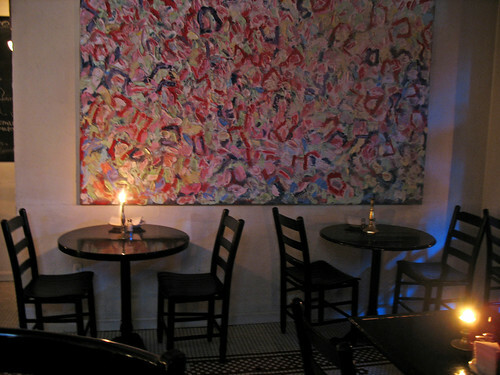 It’s a really elegant but cozy restaurant – very nicely laid out, with good lighting. I arrived rather late in the evening on a Monday night so there were only a few other people eating there, although the kitchen was busy filling lots of orders for delivery. So I sat at the bar and talked to the bartender a bit. He told me that his family owned the restaurant, and when I expressed interest in the veggie burger he said that it was indeed a very good one. Pre-made, but that was because they had tried doing them from scratch but they weren't quite good enough, he said. The burger patty (organic, according to the menu) was very flavorful, with a rather mock-meat texture to it. Perfectly crispy on the outside, and soft and chewy on the inside, with bits of peppers and mushrooms visible within. 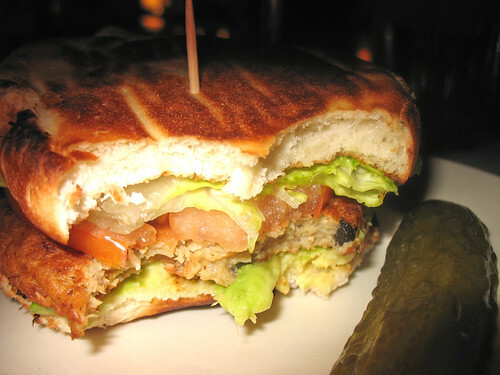 The bun was sweet and light, toasted perfectly and just the right size for the patty and toppings. 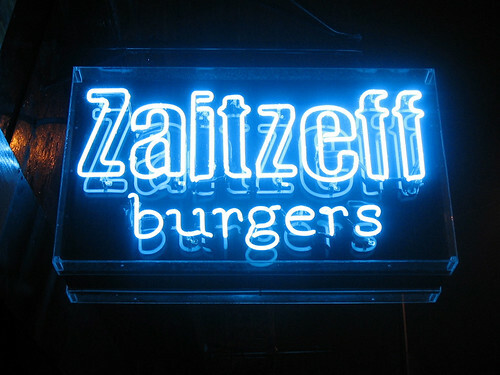 Overall, a very satisfying meal, and it lived up to my memory of the first time I ate at Zaitzeff awhile back. I have a lot of meat-eating friends who adore this place too, so I certainly won’t mind returning with them since I know I can get a good veggie burger here.